Reflections : for four percussion / Ross Edwards. Instrumentation: 4 percussion (piano, woodblock, marimba, sandblocks, 3 gongs, tam tam, cow bell, vibraphone, glockenspiel, suspended cymbal, temple blocks, bass drum. Commission note: Commissioned by Synergy Percussion with funds provided by Australia Council. Music Board. 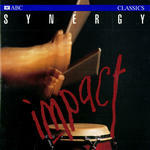 Book: Synergy Percussion : Australian percussion music in context / Peter John Martin. Article: Ross Edwards: Reflections (1985) / by Michael Hannan. 7 Jul 85: Recording Hall, Sydney Opera House. Featuring Synergy Percussion.